Ahead of his forthcoming talk at Delfina Foundation we’ve pulled out some audio from Emirates March Meeting 2011 where Wael presented his work on the crusades from an eastern perspective, as depicted through marionettes on film. One part of the quartet of film retraces events unfolding in the four years between (1096-1099) and which played a key role in subsequent historical developments, shaking to the core the Arab world and its relations with the West. 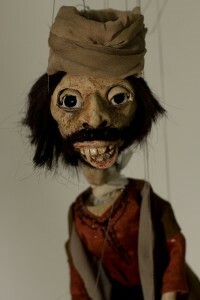 Shawky was somehow given permission to use 200-year-old marionettes from the Lupi collection in Turin and was inspired by The Crusades Through Arab Eyes by Amin Maalouf, written in 1986. The book by Maalouf, a Lebanese writer, examines the historical points of the Crusades by going back to Arab historians and their writings, most of which have never been considered by historians in the West, although Maalouf does also reference some of the most acknowledged Western sources and studies and aim to give, finally, a balanced view to this too-long-one-sided episode in the history of humankind. Wael lives and work in Egypt. This entry was posted in highlights, Promos, Shows, Six Pillars to Persia and tagged cabaret crusades, delfina foundation, march meeting, Six Pillars to Persia, wael shawky on April 6, 2011 by sixpillarstopersia.